Despite all the little warmist wuzzies hyperventilating about ice extent, this is beginning to look as if it is the year of the icebreaker. We've had the Okhotsk Sea, then the Baltic and now St. Petersburg at the eastern end of the sea. From there we get reports that icebreakers have been called in to free dozens of ships that have become trapped in ice in the Gulf of Finland. At least 97 ships were still waiting for help as of Tuesday, although this is down from 160 ships two days previously. 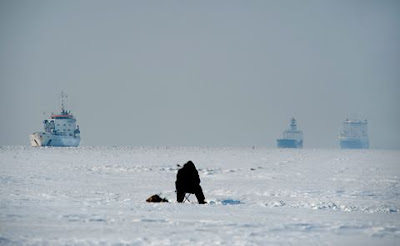 The eastern Gulf of Finland has not seen such thick ice since 1992, according to the Federal of Sea and River Transportation Agency. In some places the ice is more than three feet thick. The strength of the pressure exerted by the ice is measured at three points — a serious threat for the exteriors of the vessels, so we are not talking about a jolly little rest cure here. Think bent metal, big 'oles and bubbles. The icy conditions also have significant economic impact, which is making shipping operators wish rather fervently for more less warming ... to bring a reduction in the ice. Most of the trapped ships are cargo vessels, but some are passenger ferries. Many have been trapped for a several days. Among the ships freed over the weekend was a ferry that had been stuck for six days with 12 people on board, including a pregnant woman. The ferry runs between a port near St. Petersburg and the Kaliningrad region. The Princess Maria ferry running between St. Petersburg and the Finnish capital, Helsinki, has been suspended since 9 March, but was due to resume its operation on Wednesday. 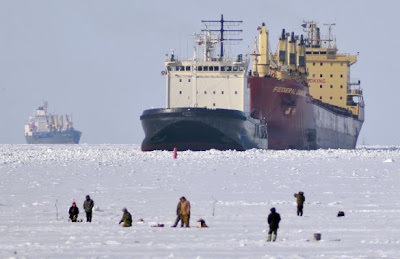 The federal agency says that ten icebreakers, including the nuclear-powered Vaigach based in Murmansk, were leading the ships to open water in caravans. Andrei Kovalyov of Rosmorport, a state company overseeing seaports, said passenger ferries and ships with hazardous cargo were being given priority. He says the situation could improve within three weeks if weather conditions were favourable. Given this sudden rush of global warming, for those who might be considering their long-term future and looking for a stable career, with prospects, at the moment "icebreaker crew" looks extremely promising (although you might find it difficult to convince people you were serious if you said you worked on the Mudyug - icebreaker pictured, top). 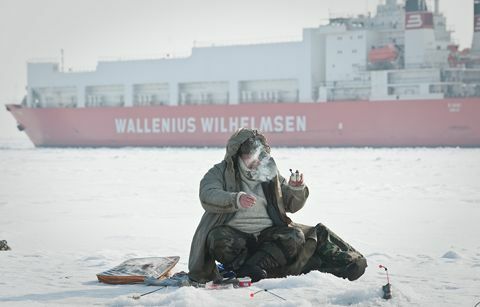 Ice fishing (pictured) also looks good.